I am an absolute sucker for baby patterns. 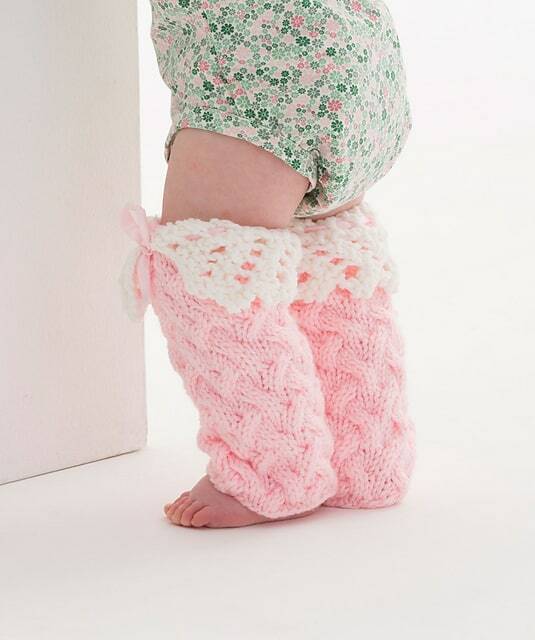 This photo of legwarmers over chubby little baby legs makes me want to break out the yarn to quickly knit them up. Add to it that they’re in my favorite knit cable and it moves right up to the “must make immediately” list. I’ve always known this cable as a sand cable. It’s really a lot easier than it looks. Even though it has this look of everything weaving in and out, every which way, you will only be working in one direction at a time. 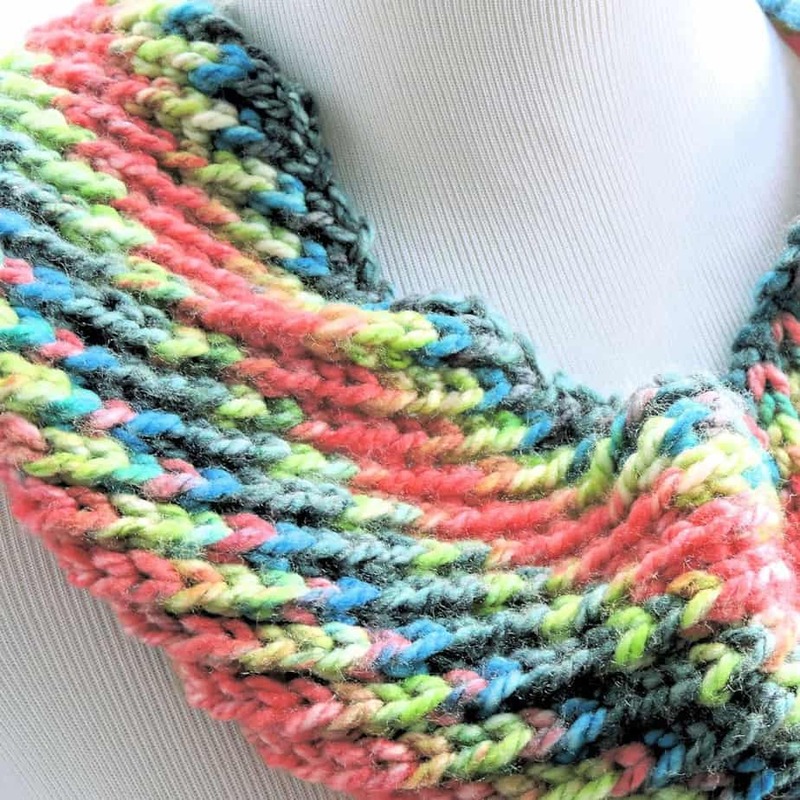 For this one, you’ll be working with a 4-stitch cable, so you won’t be overwhelmed by a super wide braid. And, you’ll be cabling on every fourth row: right-leaning cables across, three rows of knit, left-leaning cables across, three rows knit. You see how easy that is? This is also an excellent opportunity for you to learn to cable without a cable needle. Review the first video below because I promise that you can do this without having to use another tool. You’re just crossing your stitches out of order. The pattern says Cable4Back (C4B) and Cable4Front (C4F). In order to cable without a cable needle, you just need to know that C4B means you will follow the video for the right-leaning cable and C4F means you will follow the video for the left-leaning cable. I recommend that you learn and use the no cable needle technique for this because you aren’t going to want to deal with a cable needle while you’re messing around with double-pointed needles. Yes, indeed, you’ll need DPNs for this. You are going to be making a small tube. If you make larger tubes, something like a cowl or poncho, you could work with circular needles, but these legwarmers are too small for circular needles unless you get into another technique and I’m just not ready for that other technique At. All. DPNs, it is. At least they’re not teensy tiny DPNs, right? We’ll be working with a set of five. Deep breath and let’s go. I highly recommend that you review the second video below to learn how to use DPNs in the round like this. This is one of those things in knitting patterns that isn’t always explained thoroughly in the pattern, so I’m going to go over it step-by-step. You’ll begin by casting on your stitches on one double-pointed needle: 42 for the smaller size or 54 for the larger size. Now, you’ll just distribute those stitches evenly between four DPNs to form a circle. Don’t be scared! You just move them over. You’ll end up making a circle of stitches. The fifth DPN will be your working needle. You will always have one left over so you can actually work your stitches. Before you start distributing, you will want to think about your stitch pattern. This stitch pattern needs a 6-stitch repeat of knit 2 and a 4-stitch cable crossing. You don’t want to accidentally have your cables split between two DPNs. You’re going to need the entire four stitches of each cable on one DPN. Remember that you’re twisting the four stitches to make a cable? You don’t want to have two of those stitches on one DPN with the other two on the other. This is a really easy fix. You just want to ensure that you have multiples of six on each DPN. 42 stitches will be seven repeats. You have to distribute them on four DPNs. I would end up putting 12 stitches on three DPNs with 6 stitches on the last one. With 54 stitches, you will distribute nine repeats. I know this is uneven, but I can live with that. If you want to distribute more evenly, you will end up having to move them back and forth in order to do the cabling. It’s better for me to just get them set up so I can use the stitches without having to constantly distribute them back and forth. My biggest problem with working in the round has always been a big loopity-loop at the join. I’m thrilled to say that Johnny’s video has a cool slip stitch with the first stitch of joining which closes that up nicely. Be sure to check that out. One other important thing that is not mentioned in the pattern is that you will need a stitch marker. When working in the round, you are working in a spiral with no beginning or end. You need to keep track of your rounds, especially with a cable crossing every four rounds. That stitch marker is a crucial element. Definitely use it. Just put it on the needle at the join and move it up as you complete each round. It’s just there so you can keep your place. Now that you have all these tips, we’ve turned this pattern into a much easier project and it will be such an excellent project to learn several different techniques. For those of you teaching, you can teach your students: 1) using DPNs to work in the round and 2) making cables without a cable needle. This is perfect for those students who are ready to progress beyond the basics. 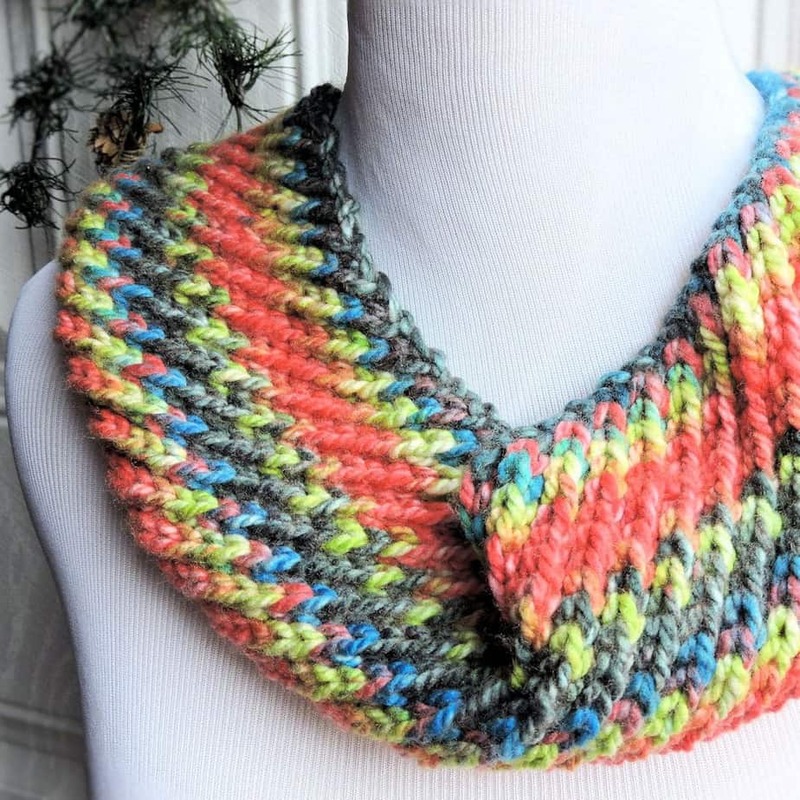 Pick up your free knit pattern download from Red Heart yarns HERE. Find Chandi Agee of Expression Fiber Arts HERE. Find Johnny Vasquez of New Stitch a Day HERE. While browsing knit patterns, I discovered this fascinating beauty which looks like it would be an amazing project to make for anyone, male or female. The scarf looks like it’s reversible with more of one color on one side and one side on the other. I’m always intrigued by color patterns like this so I had to know more. After reading through the pattern, I discovered that it’s really very easy. This is so easy that it will make a wonderful project for a first time two color project. Ordinarily, you may think that you are going to be switching colors back and forth in a row, but that is not the case here. This project incorporates slip stitches to pull one color up into the next row so it gives you the illusion of switching back and forth. Let’s break it down so you have a better idea of the ease of this stitch pattern. There are only four repeating rows. Two of those rows are knit. The other two are knit the first stitch and then you will will repeating “slip stitch, knit stitch” across. Other than those slip stitches, you are just making a garter stitch scarf! You just can’t get any easier than that. 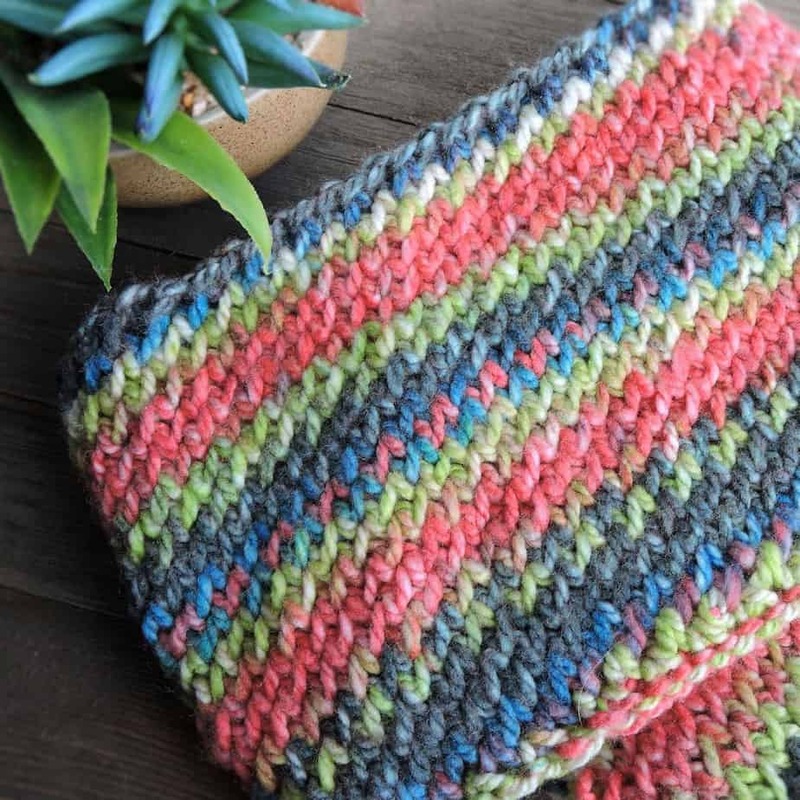 The only new thing you may need to learn is how to do a slip stitch. That’s easy. You just insert your needle in the stitch, pass it over to the right handle needle without working anything and then you just carry on with you knitting. That’s it. 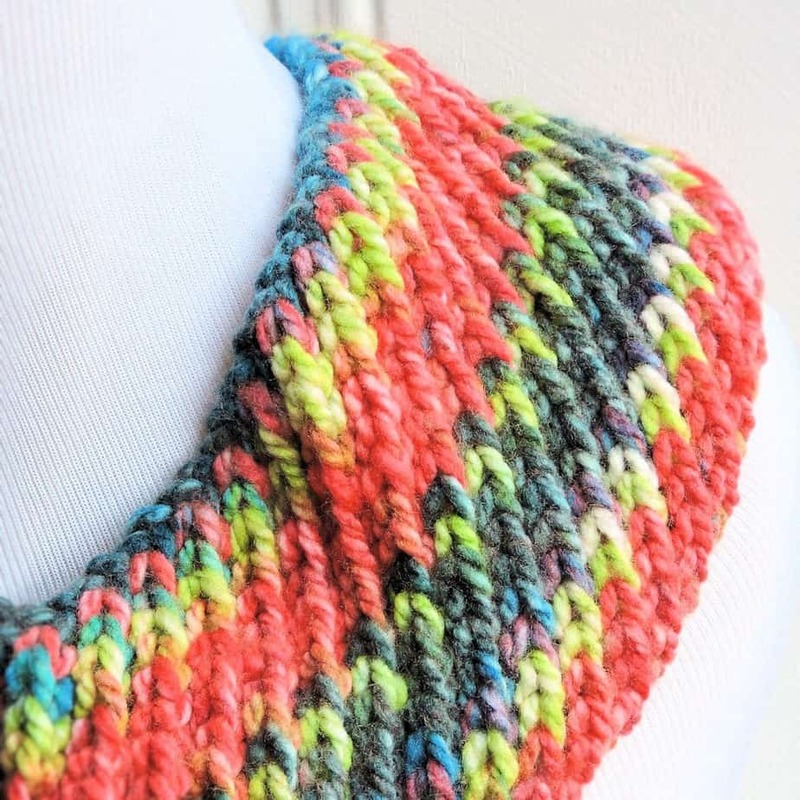 You have a garter stitch scarf with some slip stitches. The key ingredient when you’re learning to knit is how you actually insert your needle when you slip a stitch. The default way is to insert your needle into the loop as though you were to purl then you’ll just slip it over. You will slip your stitches purl wise, unless the pattern specifies otherwise. In this pattern, you will be slipping stitches on both the front and back sides so you need to keep the yarn to the back when you’re working on the front side and to the front when you’re working on the back side. This keeps the wrap in the back of the work. If you have trouble determining the front (right side) and back (wrong side) of your work, you can place a stitch marker on the front of row 2 so you will always know that the stitch marker side is the front side. I’ve included a nice video from Staci of Very Pink Knits which demonstrates all the different variations of a slip stitch. Of course, you will only need the first two for this particular scarf. Always remember that the default way to slip is purlwise with yarn in back when the pattern isn’t specific. Pick up your free knit pattern from Purl Soho HERE. 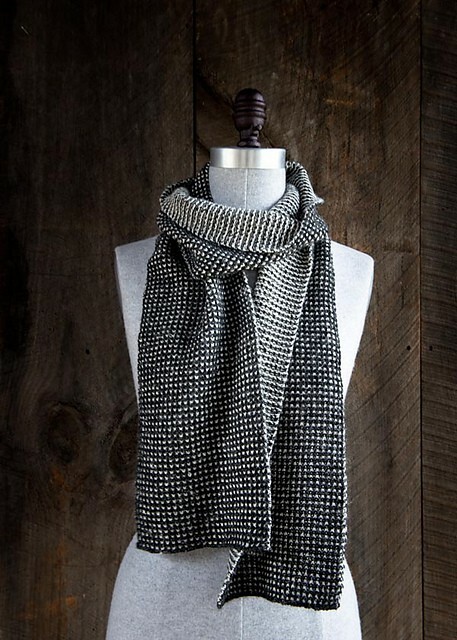 Once you have mastered this technique with the Speckled Scarf, you may want to consider this gorgeous Mosaic Blanket, also from Purl Soho. It includes the same technique demonstrated in the scarf but adds even more detail with the lattice formations. You can pick up the free pattern for this one HERE. Catch up with Purl Soho on Ravelry HERE and Facebook HERE. 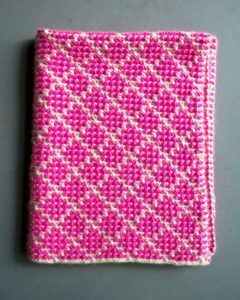 Find Staci of Very Pink Knits on Ravelry HERE.